Now that you're registered to attend Customer Contact Week, make sure to take a look at the resources we have put together just for our attendees. To thank you for your support, when you post on LinkedIn, you'll automatically be entered into our prize drawing, with a chance to win prizes including an Apple iPad, FitBit, AmEx gift cards and Apple Watch! See below for an assortment of social posts & graphics, which you can use to promote you participation! We can't wait for you to join us in Vegas! 1) Copy & Paste the entire description below as your LinkedIn Post. 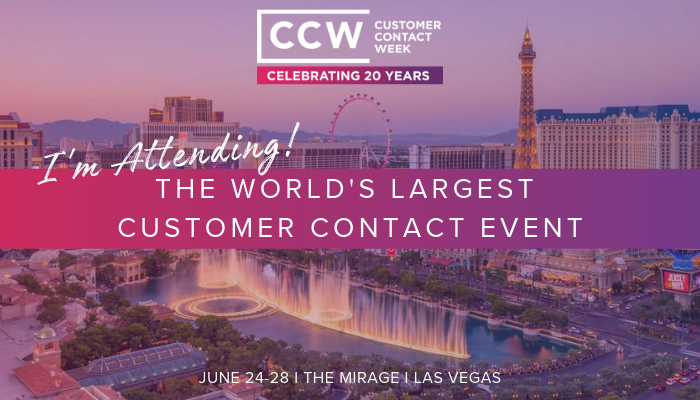 I'm attending Customer Contact Week Vegas, the world's largest customer contact event, June 24-28, 2019 at The Mirage in Las Vegas! In 2019, CCW is celebrating 20 years, and to celebrate, they're bringing together an exciting list of experts to lead the event program including: Earvin "Magic" Johnson, Chairman & CEO, Magic Johnson Enterprises; Tony Hsieh, CEO, Zappos; Ambassador Nancy Brinker, Founder, Susan G. Komen; Troy Stevenson, VP & Global Head of Community Operations, Uber; Shep Hyken, Chief Amazement Officer, Shepard Presentations; Sasha Chatani Lucas, Head of Digital, Verizon Fios; Meghan Borsic, Head of UX Research and Design, Consumer Electronics, Amazon; Sundar Chari, Director of Customer Experience, Hertz and many more! Looking forward to joining 2500+ CX and customer care executives and hearing from these experts! Check out more information here: https://ptdrv.linkedin.com/q6uwur2 or email info@customermanagementpractice.com. 2) Right Click & Save the image below to go along with your LinkedIn post. 4) Email Giulia.Savino@customermanagementpractice.com to confirm your posting. 5) And most importantly, GET EXCITED FOR CCW! 2)Then, copy & paste the link: http://bit.ly/2BMzG6p to embed into the banner!